The Christmas Carols for Kids, Sing Along Songs – Jolly Jingle iPhone, iPod Touch, and iPad is a cute, fun music app to help your children learn the lyrics to popular Christmas songs. The successful integration of gesture controls and fun graphics make it the perfect accoutrement for family bonding–or for keeping the kids constructively engaged while you frantically wrap gifts. The song screen is engaging and stimulating for preschoolers and elementary age children. The song begins, and cute angels, snowmen, nutcrackers, Santas, gingerbread men, kids, and unicorns bounce happily around the screen. You can use finger swipes to spin angels in bubbles, as you watch the lyrics pop up at the appropriate time at the top of the screen. The music can be changed between four arrangements by touching the candy cane icon. The selections include instrumental, kids choir, female solo, and piano solo. The kids choir is definitely the best choice. 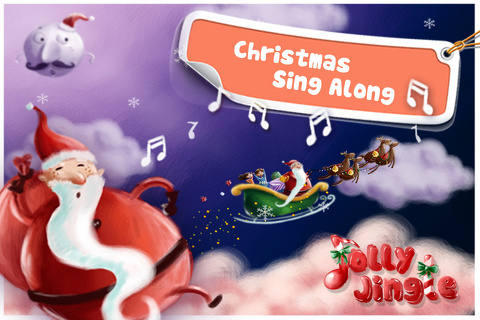 The Jolly Jingle iPhone, iPod Touch, and iPad app is a great way to teach your children and grandchildren Christmas songs. It is also a great addition to your cookie swaps and holiday parties, and it will, of course, be a fun soundtrack to your final days before Christmas. 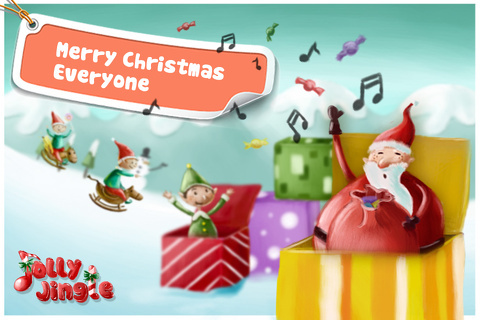 AppSafari review of Christmas Carols for Kids, Sing Along Songs – Jolly Jingle was written by Jenni Ward on December 22nd, 2012 and categorized under App Store, Education, Fun, Games, iPad apps, Kids, Kids, Music, Universal. Page viewed 4198 times, 1 so far today. Need help on using these apps? Please read the Help Page.